Tanvir Ahmed netted his first goal for visitors Sporting Bengal as they defeated Woodford Town at The Harlow Arena on Friday night. Ahmed found himself in acres of space inside the right-hand side of the box to take a touch a power an effort beyond James Scammell right on half time to give the visitors all three points. It could have been better for the Mile End side but saw Charles Gregory’s penalty kick saved early in the second period, but the win sees them remain in seventh, whilst defeat for Woodford sees them slip a place to sixth. Hosts Barkingside are off the bottom of the table and a point ahead of Leyton Athletic now after they thrashed Sawbridgeworth Town at Cricklefield. Mario Gjini put the hosts ahead after just six minutes before Isaac Marfo doubled that lead in the 34th minute, but the Robins pulled a goal back a minute before the break through Jamal Allen to give them hope of a comeback. But Derek Ohalem restored the hosts two-goal cushion on the hour mark before Marfo netted his second and Side’s fourth four minutes later and the win sees them now just six points behind the teams above them. Sawbridgeworth stay in tenth despite this defeat, their 12th of the campaign. 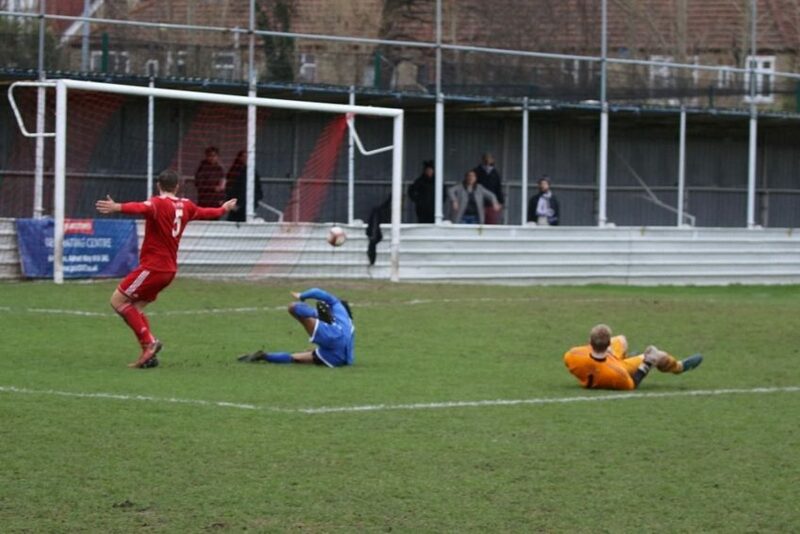 Coby Miles netted five minutes from time to give Takeley all three points against Clapton at The Old Spotted Dog. Matthew Gill put the visitors ahead in the 57th minute, only to see Giovanni Palmer level the the Tons eight minutes later, but Miles netted an 85th minute winner to give the Station Road side the win and keep them second, six points behind leaders Stansted with a game in hand. Clapton slip down to 14th. Leyton Athletic slipped to the bottom of the table after they saw braces from Charlie Portway, Dan Trendall and Matt Frew help opponents Walden net seven in what was a thrashing at Catons Lane. The opening goal didn’t arrive until the 33rd minute when Portway netted a penalty, and a minute into the second period Trendall netted The Bloods second. Portway then added a third soon after before Frew netted his first in the 65th minute to make it four, and then he added another in the 73rd minute to make it five for the home side. Karolis Atutis then made it six with seven minutes to go, and then Trendall rounded things off in stoppage time to make it seven for the hosts and see Walden remain fourth in the division. Athletic are now winless in sixteen league games and are bottom, a point behind Barkingside. The Foxes netted a welcome victory after two early goals saw them defeat Southend Manor at Southchurch Park. Both goals came inside the opening quarter hour mark, the first from Danny Haigh after just seven minutes before Collins Atubrah made it two on just twelve minutes. Ilford move up to 12th after this victory whilst Manor stay fourth bottom, just six points ahead of second bottom Barkingside. The Airportmen remain six clear at the top after putting St Margaretsbury to the sword at Hargrave Park. Callum Ibe netted the opener in just the seventh minute before James Peagram doubled that lead ten minutes later. It remained that way until seven minutes from time when Ibe netted his second, and then late goals from Jack Mitchell and Moses Carvelho rounded off the league leaders afternoon in style. The visitors, for whom this was their second heavy defeat in a row, remain in eighth spot. Rovers came from behind to defeat Hoddesdon Town at The Hawthorns, Scott Hayes had put the Lilywhites ahead in the 29th minute, but Tyler Kemp then levelled things up in the 63rd minute. And Scott Kemp then netted a 90th minute winner to give the hosts all three points, seeing them in 11th spot, whilst Hoddy remain 9th. Hullbridge lost ground to the top two after they were held at Mile End by Tower Hamlets, Wale Odedoyin put the hosts ahead in the 19th minute before Adebola Sotoyinbo levelled the contest up from the spot nine minutes before the break. Hamlets do remain third bottom on goal difference and just six ahead of second bottom Barkingside, whilst Sports slip to third and now seven points off the lead with two games in hand. Stow netted five against Redbridge at Kitchener Road for the second time in a matter of weeks after braces from Dwade James and Leon McKenzie helped them to a thumping win. James netted a 25th minute penalty to open the scoring before Correy Davidson made it two just a minute before the break. McKenzie then netted a minute after the break before James made it four with twenty minutes remaining, and although Dan Gilchrist pulled one back three minutes from time the last word went to the hosts who saw McKenzie net a fifth and see them now up a place to fifth and seventeen points off leaders Stansted with four games in hand. Redbridge’s recent revival comes to a crashing bump and defeat leaves them in 16th, five points above the bottom four. Hosts West Essex put their awful home form behind them to net an emphatic victory over Enfield at Mayesbrook Park. Joe Lefley put the hosts ahead in the tenth minute from the spot before Michael Mignot doubled their lead ten minutes later, and it was three on the half-hour mark when Hakim Medfai netted. Ben Bradbury pulled one back three minutes later but West’s three-goal lead was restored seven minutes into the second period when Mignot netted his second, and although Ernold Haxhia pulled another one back for the visitors seven minutes from time, Symeon Taylor netted a fifth for West two minutes into stoppage time to complete a terrific day for the home side. West are up to 13th whilst Enfield remain 15th.